I cannot tell you how happy I was to finally see this movie. I loved it, and I usually don't like romantic type movies. So, the movie is about a young woman named Louisa Clark, and she is looking for a job. She comes across one where they are looking for a care giver. She assumes it's for a older person but it's actually for a couple's son, Will Traynor, who was left paralyzed after a motorcycle accident. Will was a successful banker until the accident. He's a bit cynical and has a sort of spunkiness to him. Louisa, is a tender hearted girl, who always wants to make other people feel happy, and is very caring. The movie brings up a very touchy subject in today's America. Assistant suicide. While Louisa is tending to her duty, she overhears his parents talk about something they received and that Will still kept his promise to give his parent's 6 months or he will go to Switzerland. The movie completely tears you into two pieces because on one hand you want to support Will's decision, but on the other hand you want the movie to end "well" as every other movie. Louisa, however has a boyfriend, and she hasn't had the hear to tell him that she has fallen in love with someone else. I think though that as we are introduced to her boyfriend (who is Nevell from Harry Potter by the way) you can already see that it's just not going to work out. The movie is quirky and funny at time, then another time you want to cry or slap a couple people in Will's life. The movie shows the truth about someone in Will's situation, and how we as human beings want to hold onto someone as much as possible. That's what I like most about the movie because it brings up an ending that you didn't expect. I know this review isn't a very big one, but I want to leave it as vague as possible. I really liked the movie. I do however feel that the beginning was rushed, but in the movie a few months has passed by. My favorite part was with the bumble bee stockings. I found that part to be the sweetest part. 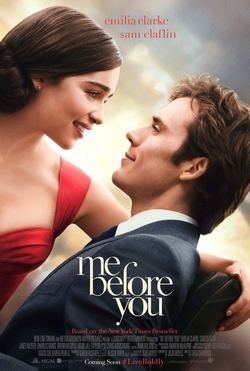 I do suggest seeing this movie, even if you do not like romance movies, and I also suggest reading the books.